Getting ready for my first summer workshop! 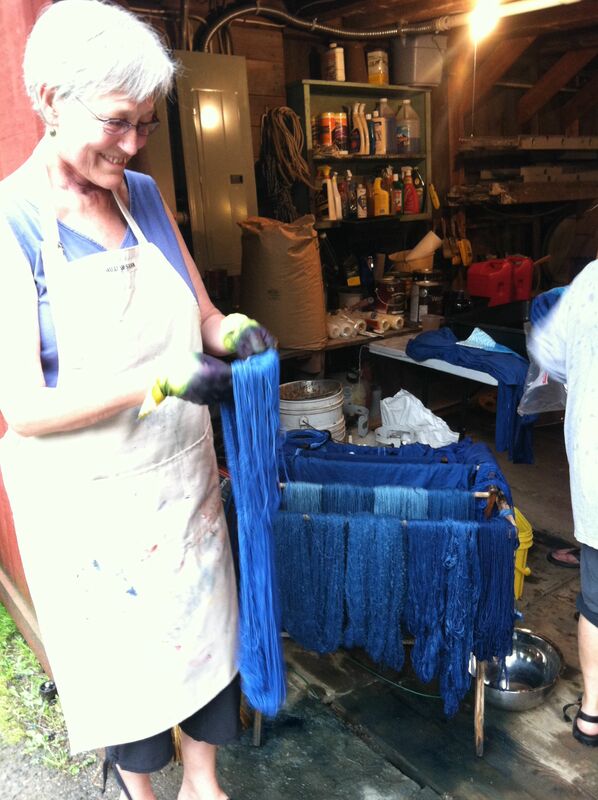 A trip to New Hampshire for a day of indigo dyeing. 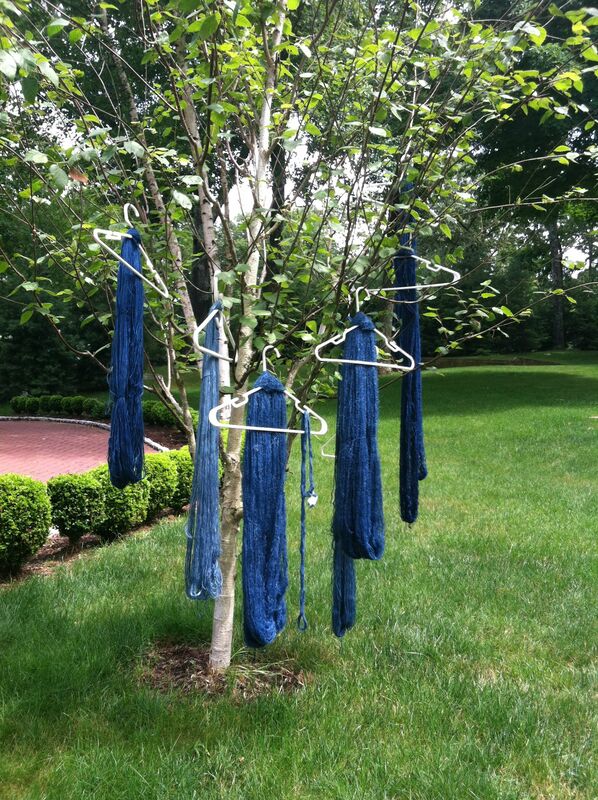 Luckily no mordant is needed for indigo dyeing, but my yarns must be clean and free of sizing and dirt, so I gave them a good soak in Eucalan and hung them out to dry! 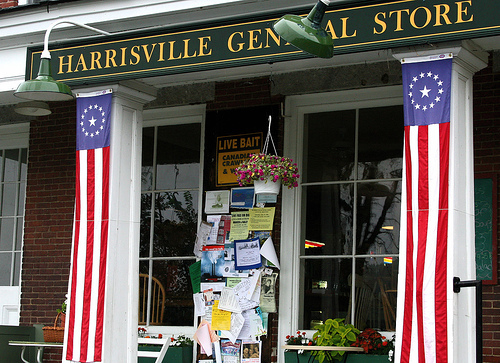 I started the weekend with a trip to Harrisville Designs. What a scenic spot! The building further in the distance houses the retail shop and the workshop studios. Other buildings house the spinning operation for the yarns and the woodworking shop for building the looms. This was the first sweltering hot day of the summer, so it was lovely to be in a town so full of water. 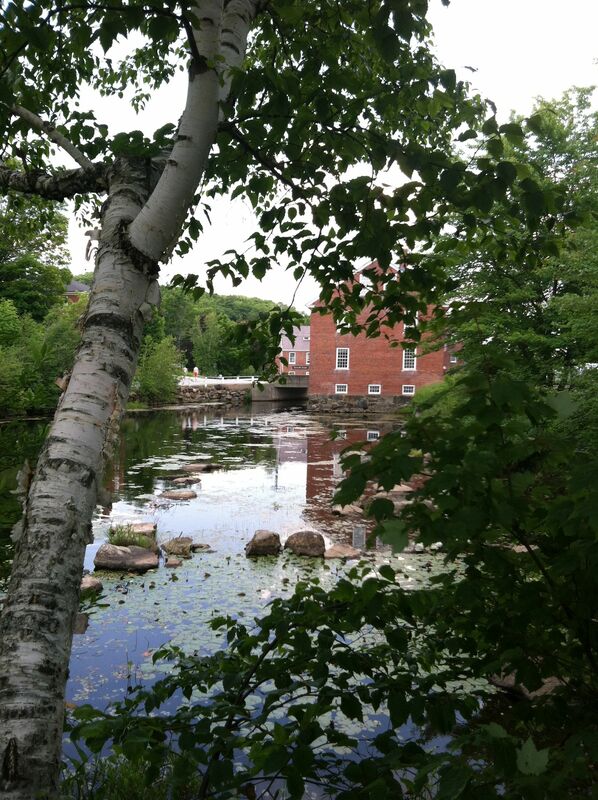 The library sits just a short walk from the Harrisville Design buildings and is on a large body of water called Harrisville Pond. Such still water here funnels into a stream that rushes past the mill buildings in the previous photo. 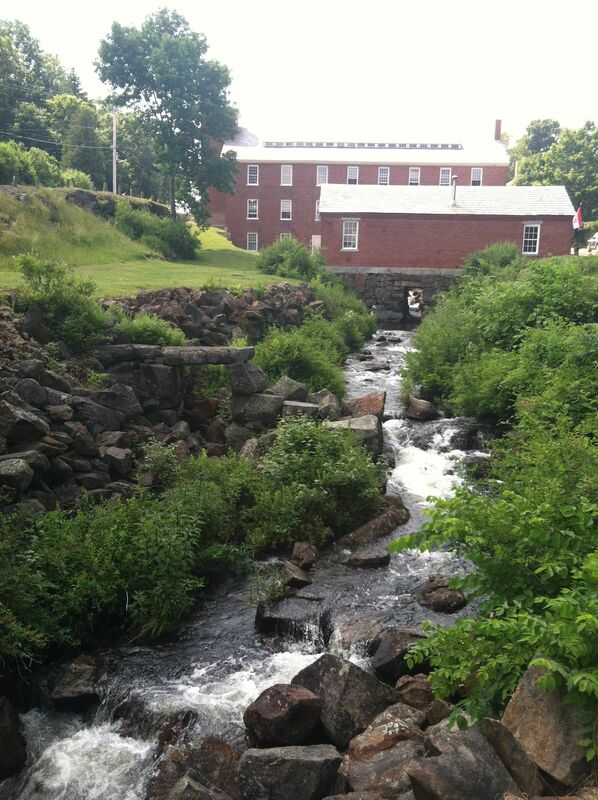 A delightful place to have lunch, overlooking the Harrisville Design buildings, the rushing stream and the distant mountains! What an idyllic spot! 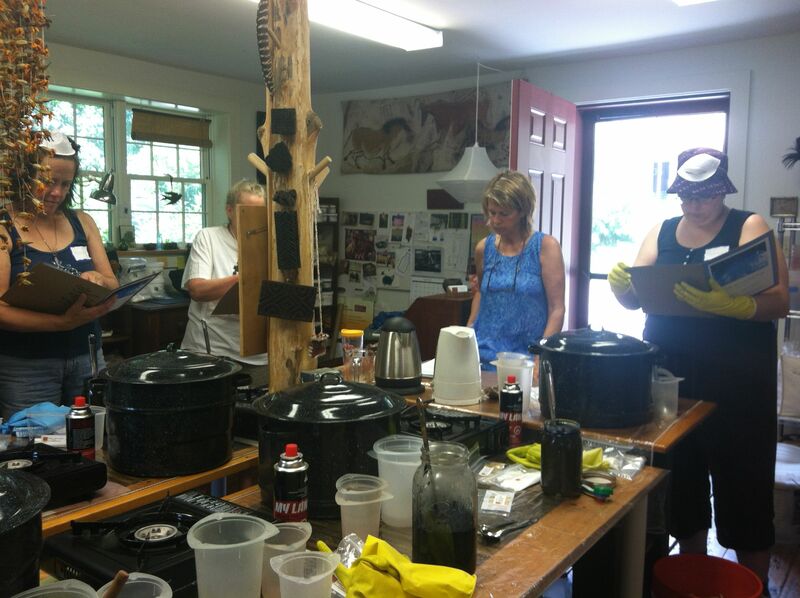 The dyeing workshop took place at Long Ridge Farm in Westmoreland, New Hampshire, owned by Nancy Zeller. The studio is on the right and includes a beautiful balcony on the back where we had lunch in the canopy of the surrounding trees. The barn is on the left. The next morning was the workshop at Long Ridge Farm in Westmoreland, New Hampshire. Another idyllic spot, with beautiful views of mountains, gardens, and sheep! 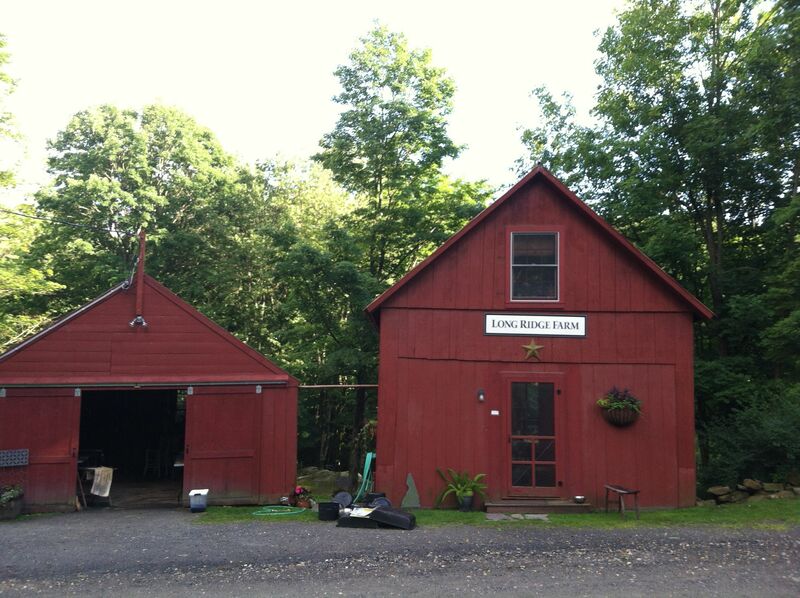 Nancy Zeller owns this bit of heaven and runs various workshops from her studio and barn. We started the day in the studio, pictured here, but moved outside when the going got messy, and then moved into the barn when a thunderstorm passed by! Through out it all, Nancy remained calm and organized! She is a terrific teacher! 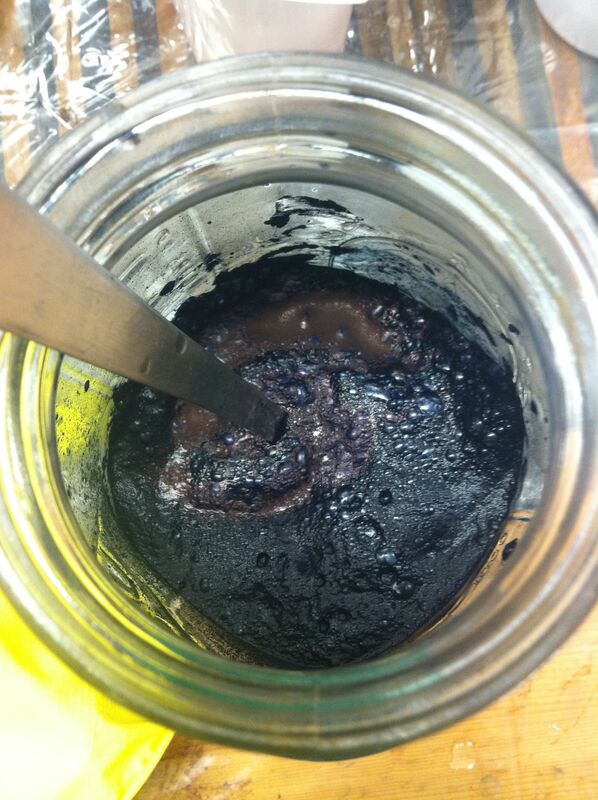 Mixing the stock solution from powdered indigo from India. 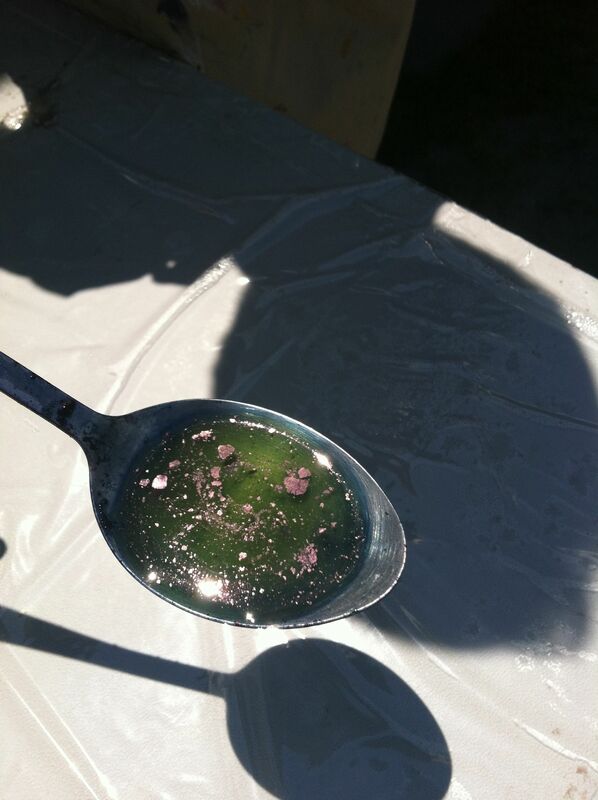 The color change: blue on top where the stock has oxygen, and yellow/green beneath where there is no oxygen. After the addition of Thiourea Dioxide and Lye (both of which get mixed separately with water in their own container before being added to the vat) we checked the color of our new indigo vat. 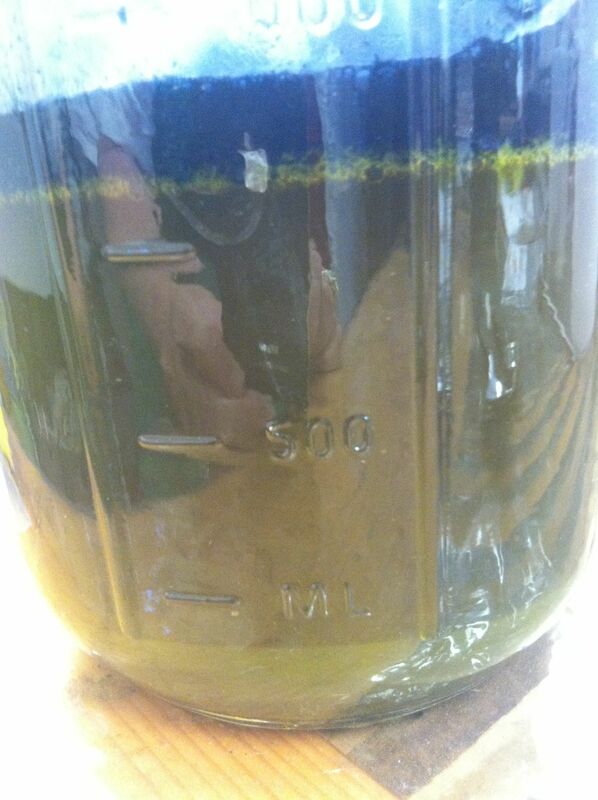 Yellow/Green color along with a Ph between 9 and 10 meant we were ready to dye! My friend Susan standing near the growing skeins of indigo dyed yarns. Look at all our gorgeous skeins of blue! My friend Susan joined me for this workshop and she brought lots of cotton skeins which turned purply blues. My skeins of merino and mohair and mohair/merino blends turned various shades of French blue! It was so exciting! 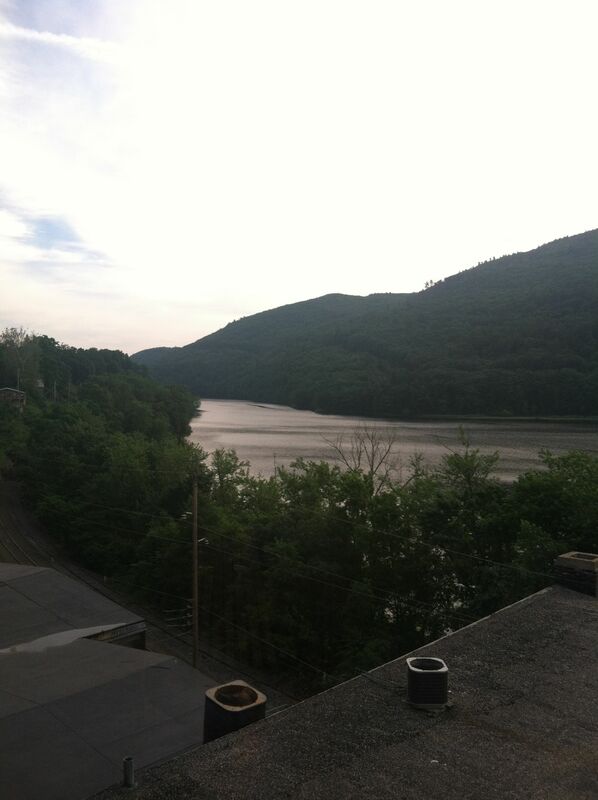 Our stay was enhanced by a bit off shopping in Brattleboro. 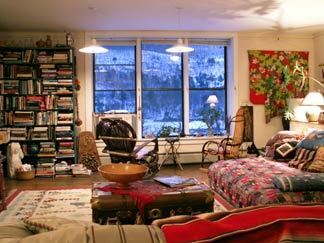 The fabric shop Delectable Mountain Cloth is a must! It is full of beautiful textiles, and I believe they are all natural fibers. The food in Brattleboro was also a high point of the weekend! Dinner at Fireworks and breakfast at Elliot Street Cafe were both great. The ultimate dining experience occurred at Burdick’s Restaurant in Walpole, New Hampshire! That is a destination in itself! 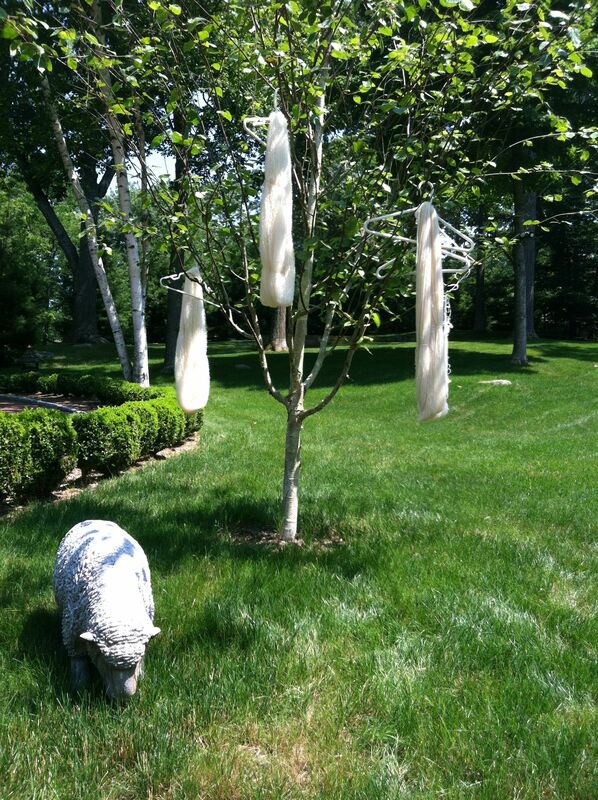 Back home with my newly dyed skeins drying in the birch tree. It was a great workshop, and I highly recommend Nancy Zeller as an instructor! Her farm is a wonderful destination and she is a thorough and organized teacher. What a terrific weekend! This entry was posted in dyeing, travel, yarn. Bookmark the permalink.